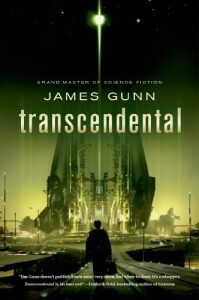 I was honoured to be able to interview SFWA Grand Master James Gunn about his newest novel Transcendental (here’s my review!) and more. I don’t think my questions even scratch the surface of the experience that Prof. Gunn has had, but there are still lots of fascinating details in there. For those readers that haven’t read TRANSCENDENTAL, could you tell us a little about it? TRANSCENDENTAL is set about 1,000 years in the future when humanity has emerged into the galaxy to find it controlled by aliens who resent the intruders. After a destructive ten-year war, the uneasy peace is threatened by rumors of a transcendental machine in an unknown part of the galaxy. TRANSCENDENTAL tells the story of a group of assorted aliens and humans who set out in a shabby wartime spaceship to find the machine if it exists, as each of them tells his/her/its own story of why they are on this pilgrimage and what they hope to gain from it, for themselves and their species. But lies, betrayals, and death make the spaceship Geoffrey a battleground of hidden forces and motives before it reaches its destination. What makes TRANSCENDENTAL unique when compared to your other books? What inspired you to write it? TRANSCENDENTAL is my return to the genre known as the “space epic” with which I started my novel-writing career in 1955 with STAR BRIDGE and THIS FORTRESS WORLD. Now I have returned to it with, I hope, more wisdom and skill to tell a different (and perhaps more human) story. This is my standard question for genre writers – how do you approach world building? How do you come up with a plausible universe and how do you make your aliens seem truly alien? For me the world building (or galaxy or universe building) emerges out of the story premise (unlike Hal Clement, for instance, who invented the world of Mesklin and MISSION OF GRAVITY grew out of that). My premise of a transcendental machine needed a world of the future, a technology of jumps through hyperspace and needing maps of coordinates, a galaxy separated into different spiral arms by gulfs difficult to cross, a galactic confederation of aliens who have developed their own hierarchies and relationships, and a history to support all these and provide substance for the central concerns of the novel. My aliens are all different because I wanted to show the universality of sapience and the desire for fulfillment of potential that is at the heart of the evolutionary force. And in the stories I gave them an opportunity to tell, I tried to reveal how their cultures differed while their goals (except for my intelligent flowers) were similar, and gave them an opportunity to tell their own stories and show how their home worlds and environments shaped them. TRANSCENDENTAL is the first book by you that I’ve read (I will be remedying this soon!) Could you tell me a little bit about your previous work? Is it mostly stand alone books, or do many of your books share a universe? Which book would you consider best exemplifies your work? Like many writers, I started with short stories that grew longer as I continued to write, until I produced the two novels I mentioned above. Though they eventually sold very well in reprint here and abroad (STAR BRIDGE, which I wrote in collaboration with Jack Williamson, will be reprinted next year by Tor Books), they didn’t provide much income at the time, and I decided to get my novel-length ideas published as short fiction before I brought them together as books (which resulted in my advice to young writers, “Sell it twice”). Out of that came STATION IN SPACE, THE JOY MAKERS, and THE IMMORTALS (the last of which became a TV movie and a series (“The Immortal”) in 1970-71. Most readers consider my best book to be THE LISTENERS, but I’m fond of THE DREAMERS, THE MILLENNIUM BLUES, and particularly KAMPUS (which is about the world the student rebels of the 1960s might have made if they’d been successful, one I lived through as the person in charge of public relations for the University of Kansas during that period). You’ve been writing science fiction for quite a long time now. How has your approach to it changed over the years? Did the changing political climate (e.g. the end of the Cold War and the space race) affect it? I think I’ve always had the basic goal of taking the science fiction that I loved as a youngster and try to bring to it the literary skills I learned as I made my way through college and life. More and more, though, I found my writing becoming more social criticism (affected, as you suggest, by political and social change in the world), though being categorized as a science fiction writer (which I accept and do not deny) always makes such departures problematic when it comes to publication (thus, for instance, THE MILLENNIUM BLUES, got published only digitally and as print-on-demand and in an Easton Press collector’s edition). Somewhat related – how has science fiction in general changed over the years? Are there trends that are of particular note? Science fiction changes all the time. I have a theory that it changes every dozen years or so, when a new editor comes along with a new vision (and a new magazine) of what science fiction can be and do, and attracts writers who didn’t know it could be done that way or found there a place to publish what they had not found before. Mostly science fiction has become more skillfully written in every literary sense, although it has not come up (generally) with new ideas of what to say that match its writing abilities. The Golden Age of science fiction may not have seen as much skillful craftsmanship but the ideas were awesome. To be sure, there are a few new things being done today, but sometimes the slickness of presentation covers a paucity of content. The British new space epic is very promising and there are some U.S. authors who are doing some exciting things. Who are your favourite authors, and what books do you consider essential reading? I have an enduring fondness for the Golden Age writers who were introduced in a four-month stretch of ASTOUNDING in 1939, Asimov, Heinlein, Sturgeon, and van Vogt, and the authors who starred in the early months of GALAXY beginning in 1950, such as the late and lamented Fred Pohl (with Cyril Kornbluth) and Alfred Bester. But my selections are best listed in my six-volume teaching anthology THE ROAD TO SCIENCE FICTION and the reading list for the science-fiction novel course I taught at K.U., twenty-five novels I thought central to the science-fiction tradition (you can find the list on the Gunn Center for the Study of Science Fiction). Ed. Note: Here’s the website for the Gunn Center for the Study of Science Fiction and here’s their “Basic Science Fiction Library” page, originally developed from Professor Gunn’s list. The 2013-2014 25 novel reading list for K.U.’s science fiction course can be found here. Could you tell me a bit about your teaching career and the Center for the Study of Science Fiction that you established? 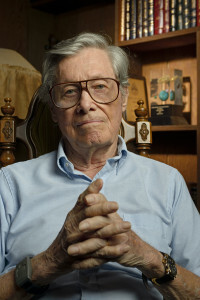 I began teaching science fiction in a student-organized course in 1969 (I was not the first–a course was taught at Colgate in 1966, and subsequently at Eastern New Mexico and Wooster) and a regular course in 1970. I had been director of public relations for the University of Kansas for almost a dozen years and decided I wanted to go back to teaching full time. I spent the rest of my 23 years before retirement teaching science fiction and fiction writing, and for almost twenty years after retirement I continued to teach the summer Intensive Institute on the Teaching of Science Fiction as well as my writing workshop. Not too long after joining the English Department full time, I discovered that I was doing a lot of science-fiction related projects, teaching, book collecting, conferences, awards, collaborating on projects in other departments, and decided to bring them together into a Center, the first of its kind to provide all of these interests under one organization (though not the first university organization devoted to science fiction), and the University administration and Board of Regents approved. The Center and its projects continue under the enlightened administration of Chris McKitterick and Kij Johnson. 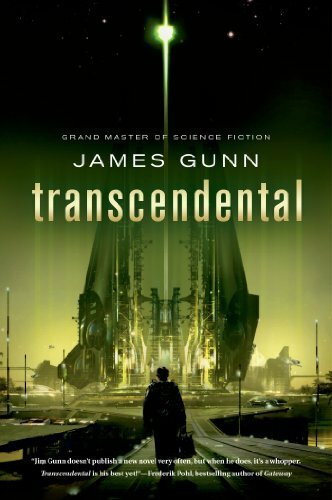 Will there be a sequel to TRANSCENDENTAL? I would love to see more of the characters and the universe, and I thought the ending left room for further stories. I’ve proposed a sequel to my Tor Books editor and even written the first chapter (and even thought about a trilogy!). I read another interview where you said TRANSCENDENTAL was a commentary on the genre of science fiction. Could you elaborate on that? Science fiction is a dialogue between authors (and sometimes readers) on subjects of great import for the human species. I’ve always felt that it was important to recognize the dialogue, and TRANSCENDENTAL pays tribute to my predecessors and large and small ways that might be interesting to readers to identify and trace. It’s not necessary to enjoy the novel, but I like to amuse myself by planting such references and perhaps entertain those readers who enjoy this kind of back-and-forth between author, genre, and reader. KAMPUS, for instance, is modeled after Voltaire’s CANDIDE and also has references to quest stories like the Arthurian cycle. If anyone wants to play this game, I might be persuaded to keep score. Aside from the sequel (tentatively entitled INSTRUMENTAL), I also have proposed a new and updated edition of my ALTERNATE WORLDS: AN ILLUSTRATED HISTORY OF SCIENCE FICTION (which is being reprinted, as well, in China) and I have written my memoir. I’ve written a lot already! This entry was posted in Interviews by Kriti Godey. Bookmark the permalink.